Who is a Brooklyn Greenspa client? Quick answer – anyone who has skin! Here is a more detailed answer – anyone who is looking for a peaceful salon where natural and organic products are used in treatments. We take pride in using Éminence Organic Skin Care products, Vegan Cosmetics Quest makeup and Beauty Without Cruelty (make-up and nail products). What makes Éminence Organic Skin Care products so great? Brooklyn Greenspa uses Éminence Organic Skin Care, voted the favourite skincare line nine years in a row at the American Spa Professional’s Choice Awards. Unlike most products, Éminence’s first ingredient is not water – it is actual product, not something which is diluting your product and that you have to pay for! Will you be offering Botox or fillers? At Brooklyn Greenspa, we made the decision to focus on non-invasive treatments, using touch rather than machinery. We recognise that we cannot be everything to everyone, and there are many specialised practitioners for injectables and machine-based treatments. 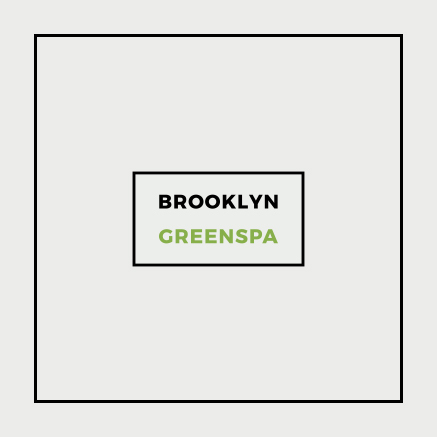 What makes Brooklyn Greenspa different from other skincare salons? Brooklyn Greenspa is an oasis of tranquility and relaxation – this extends to our treatment rooms, where our staff will allow you to read, listen to your favourite music or even fall asleep. The interior design was carefully thought out to be easy on the eye and all the senses. Brooklyn Greenspa has treatment beds that are height adjustable, an accessible toilet and is on the ground floor, allowing most people to experience our treatments. At Brooklyn Greenspa, our aim is to achieve great results without the need for harsh and invasive treatments, concentrating on the skill of the therapist, their touch and the premium active ingredients from our award-winning skin care line Eminence Organic Skin care, rather than just relying on machines. We have a steam/shower room, so you can steam before appropriate treatments to open up pores and prepare the skin for exfoliation and product penetration. You can also shower after certain treatments. All of our products have been carefully sourced over many years from both sides of the pond by our founders. Every brand was chosen because of its efficacy, its natural composition and ethics. Brooklyn Greenspa only offers skin, body and nail treatments so that means excess noise is at a minimum. Our hours are vary depending on the time of year. Please check the Contact page for up to date information. Does Brooklyn Greenspa offer treatments to teenagers? Brooklyn Greenspa does offer treatments to teenagers but depending on the teenager’s age, a parent/guardian might need to sign a consent card before we do any treatment, including manicures, pedicures or facials. Éminence Organic Skin Care has a targeted skin-care regime and products for congested, oily skins and those prone to breakouts. Teenagers and their parents may be concerned over the initial cost of buying these products. However, due to their concentrated formulae and the amount you need to use, the cost actually works out the same as high street brands over the long run. Some treatments require a patch test – when booking over the phone or in the salon, you will be informed of this. Our online booking system also flags this up for you. You need to allow up to 48 hours between the test and your treatment. By booking online, you can book up to one hour before a treatment, depending on availability, whilst walk-ins or phone bookings may be accommodated with a shorter notice period. It is always worth a try! Does Brooklyn Greenspa offer discounts? We are proud to offer a 20% discount on treatments to active military members and veterans. Please present your military card on your first visit to receive the discount. We will then make a copy of your card so you only need to show it on your first visit. We also offer 20% off first visit. From time to time there are other promotional discounts. Please check our Promotions page for information.